WASHINGTON— Conservation organizations today asked the U.S. Fish and Wildlife Service to protect the rare and declining dancing grouse of the Southwest, the lesser prairie chicken, under the Endangered Species Act. The new petition is based on recent scientific studies that show an increasing likelihood of the bird’s extinction across several states. Photo courtesy USFWS. This photo is available for media use. In 2014 the Fish and Wildlife Service listed the lesser prairie chicken as a “threatened” species under the Endangered Species Act. A federal court in Texas subsequently vacated the federal protections on procedural grounds, leaving the survival of the bird hanging tenuously on voluntary and largely ineffective conservation measures. Today’s petition prompts the Service to reinstate federal protections for the entire species; it seeks emergency protections for the most imperiled isolated populations, in Colorado and western Kansas and along the Texas-New Mexico border. Although a package of voluntary protection efforts have been in place since 2013, lesser prairie chickens are not rebounding to healthy and secure populations. Climate change is a serious threat to their survival, exacerbating problems caused by energy development, cropland conversion, grassland fragmentation by roads and power lines, and heavy livestock grazing that denudes the grass cover these birds need to hide from natural predators. The summer of 2011 saw some of the hottest and driest conditions on record in the Southern Plains, with ground temperatures exceeding 130 degrees Fahrenheit, a critical threshold above which lesser prairie chicken eggs cannot survive. 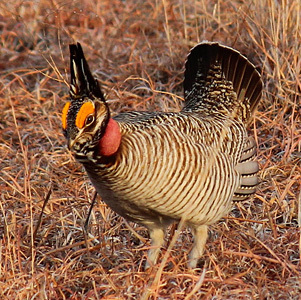 The following year prairie chicken populations plummeted to their lowest levels in decades. This year is on pace to be the hottest year on record, which does not bode well for the lesser prairie chicken. The Service announced last week it intends to conduct a species status assessment by March 2017, leaving the birds in limbo in the interim. The lesser prairie chicken — an icon of the Southern Plains — once numbered in the millions but has declined to just 25,000 birds and less than 17 percent of its original range. Experts estimate the population of lesser prairie chickens at three million birds before the beginning of Euro-American settlement on the Great Plains. A series of seminal, scientific studies on lesser prairie chickens was published in book form earlier in 2016. This book, Ecology and Conservation of Lesser Prairie-Chickens, includes a study that found a 38 percent chance of the Colorado-Kansas population dropping below 50 birds within 30 years, which would place them deep within an extinction spiral. The same study found a troubling 83.5 percent probability of the total worldwide population of the birds dropping below critical population thresholds that make recovery very unlikely. Protection under the Endangered Species Act is an effective safety net for imperiled species: More than 99 percent of plants and animals protected by the law still exist today. The law is especially important as a defense against the current extinction crisis; species are disappearing at a rate much higher than the natural rate of extinction due to human activities. Scientists estimate that 227 species would have gone extinct by 2006 if not for Act’s protections. The petitioners are WildEarth Guardians, Defenders of Wildlife and the Center for Biological Diversity.